February meeting RHS Member Ted Brown gave us an interesting talk on his family of Stonemasons. On 1st February, Ted Brown explained how his Grandfather John G (Jack) Brown came to live in Market Rasen. He was a stone mason, working for Scupham and son. 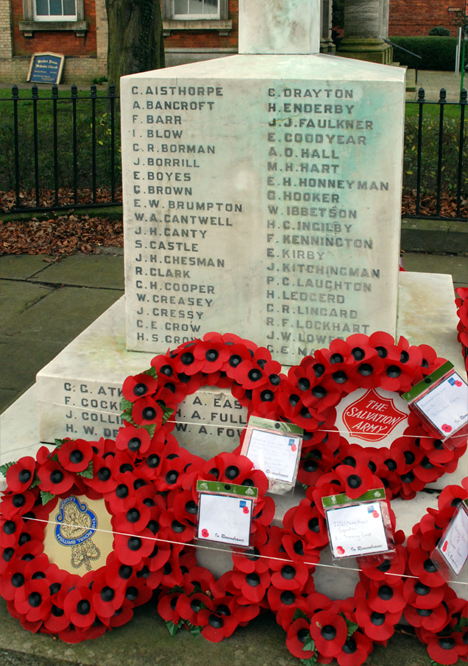 One of his jobs was to sink, with lead, the names of the men from Market Rasen who died during the Great War on the Town War memorial. He had been a soldier, and was the first POW to return home. His son George, was also a stonemason and after WW11 he added more names to the Town Memorial. Ted learnt the basics of stone masonry but left home to join the RAF and fly Vulcans. April meeting RHS Members welcomed Alan Dennis from Caistor to discuss “How Caistor and Market Rasen are linked in history“. On 5th April, Alan Dennis entertained RHS members and Visitors to an interesting talk on how Market Rasen and Caistor were linked thorough history-crime, transport, and culture. Joe Willish gave Rase Heritage Society Members and Visitors an emotional and interesting talk on his life just after WW11. Joe had been a P.O.W and was sent to Lincoln, later Market Rasen to work. He spoke of his worries for his future as a Displaced Person. Rase Heritage Society members and friends enjoyed a delightful day in Woodhall Spa. The Cottage Museum staff welcomed us with homemade cake and tea, then we went on tour of the village lead by Marjorie Sergeant. We returned to The Cottage Museum and spent an hour looking at the interesting displays. After lunch some of the Group visited the Kinema in the Woods. Photographs of the trip by Dianne Tuckett. Mal Jones RHS member lead an interesting walk around Market Rasen. The weather was kind and the members and guests enjoyed a delight 1 1/2 hour of history and architecture. There was an open invitation to all to join the RHS members on Thursday 6th September at the Library 7.30pm for the Rase Heritage Society AGM. This was followed by a photographic slideshow and refreshments. On 4th October, Market Rasen Town Council invited RHS members and guests to the Old Police Station and Magistrate’s Court for an evening of Art, Literature and Heritage. The evening started with a ‘meet the artist’ session. Jayne Cooper enlighten everyone with her reasoning behind her work whilst viewing her Art Exhibition called “Rebel Daughters”. After refreshments, Wendy Cadwallader read out her poem which had been inspired by Jayne’s work. Chrissie Chapman, then gave an interesting talk on ‘Lincolnshire Women who campaigned for Democracy’ to a packed courtroom. The Art Exhibition organised by the Town Council is on show until 27th October. Wendy Callwallader reading her poem. Photographs taken by Adam for RHS..
Caroline Foster RHS member, gave a talk on Market Rasen in 1818. Using the research she had found on the 38 men who were listed as voters for the June 1818 General Election. Widow Smith entertained the members with the gossip of the town. Followed by refreshments. more information on 1818 can be viewed by following the links via The People section.